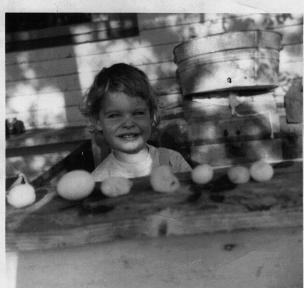 I remember the house–a big two-story white clapboard, with a large wrap-around porch, and the stairway inside that my parents had to block so I wouldn’t try to climb up with my stubby two-year-old legs and fall back down. I remember the scent of tea, the warmth of the coal-burning stove in the corner of the living room, the hardwood floor covered with a bright rug and horse blanket throws on the sofa. This is the ranch–known then as “the McCollum Place”–my grandparents moved to in the early 1940s after years of moving around, following the grass for their horses. This was the place they lived the longest, “retiring” in the early 1960s. This was my first home that my parents shared with Grandma and Grandpa for about three years after my mother emigrated from Germany, striking out on a journey of unknowns to the promise of a new and better life. 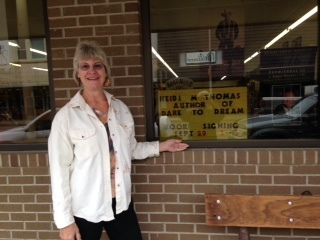 I hadn’t been back since I was a teenager, but when I visited Montana recently I drove to Ingomar, the “town” nearby. Ingomar is one of those places that you have to WANT to go to–you’re not going to happen upon it while traveling the regular Montana routes. Once the sheep shearing and shipping capitol of Montana in the early 1900s, it then boasted 46 businesses including three banks, railroad station, two elevators, two general stores, two hotels, two lumber yards, plus rooming houses, saloons, cafes, a drugstore, blacksmith shop, claims office, doctor, dentist and maternity home. 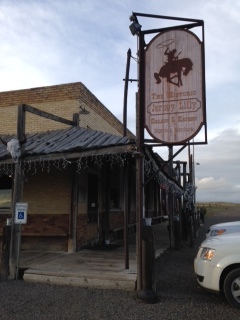 Now the population is 14 and the main business is the Jersey Lilly Saloon and Cafe. I had a vague recollection of the direction of the ranch from Ingomar, but I asked for directions, and I’m glad I did. Boots, the proprietor of the Jersey Lilly, glanced out the window at my car. “Good, you have all-wheel drive,” he said. I gulped. He explained they’d had some rain recently and the low-lying spots might still be muddy. Since my car was new to me, I dug out the owner’s manual to make sure I knew how to put it in four-wheel mode, just in case. 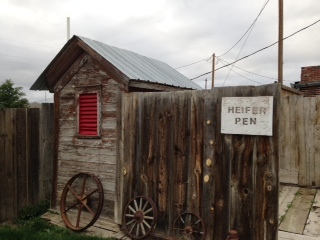 We (my sister-in-law, Marylou, & I ) followed Boots’ hand-drawn map: turn right after the cattle guard, keep going past the stock tank and you’ll have to open and close the gate… for eight miles over the rough one-track road. Fortunately, no mud remained, and I didn’t have to test out my vehicle and my memory of Montana mud-driving. 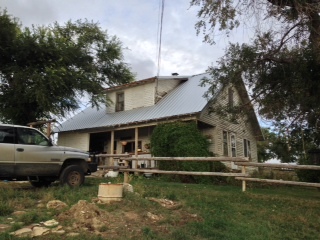 We found the house, which is still inhabited by Lance & Connie Moreland, very nice, hospitable people who are leasing the ranch. I had to smile at my memory of this “big” house. It’s two-story, all right, but it’s not large. How cramped the quarters must have seemed to my mother! The porch was not wrap-around as I had recalled, but still was a good-sized one on the front. I remember a photo of mini me at the rail with a chicken egg next to several large hailstones. The staircase is still there, and the hardwood floors. The Morelands told me that unfortunately the owner doesn’t want to spend any money to fix up the house, so it is a bit on the dilapidated side. But I’m glad it’s still lived-in and not falling down. I recently returned to my home state of Montana for a book tour, to visit old friends and family, and to drink in the beauty that is “Big Sky country. My sister-in-law (Thelma, or Louise, depending on who’s addressing whom) traveled with me. 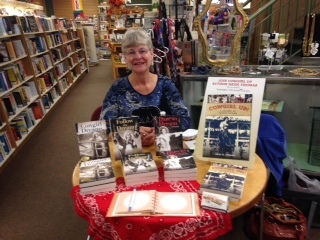 Signed books in Helena, where the state’s governor bought a copy of Cowgirl Up! for his daughter. All in all, a fun trip and a total of 5,000 miles of driving! I’ll be posting more on my travels later. 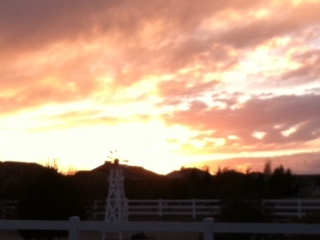 Next Tuesday, January 21, will be one year since we arrived in Arizona. We love our new home state, and my S.A.D. 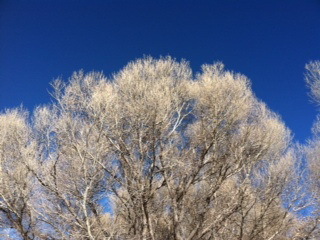 is non-existent here with 300 days of sunshine.I love the sun, the mid-60s temperatures this January, and the hiking. 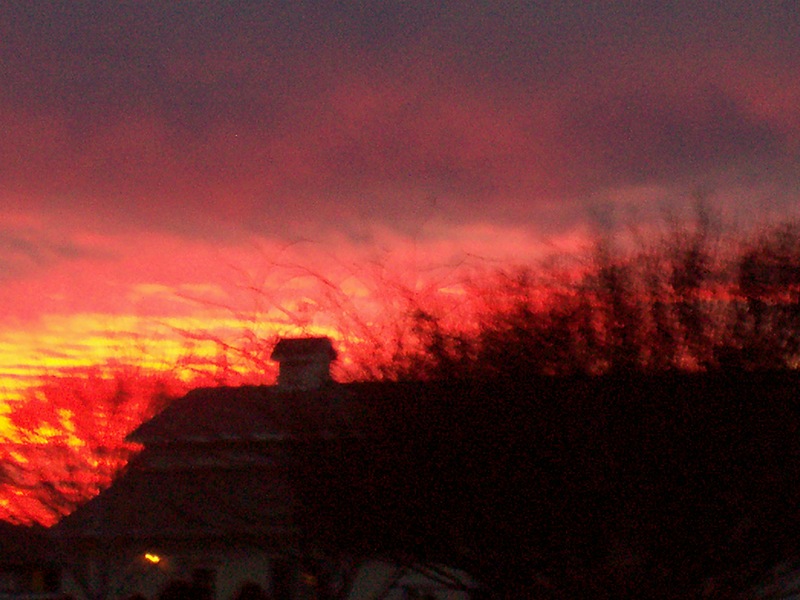 The sunsets are out of this world! All in all, we’re very happy here. The next best thing to our native Montana, but without the snow to shovel! May 2014 be blessed for all of us! Has anyone ever figured out the “mystery of the missing sock?” You know, when you put a perfectly good matched pair of socks in the wash and then by the time you take them out of the dryer, one is missing? The other mystery is how do things get lost when you move? I packed up everything and was good about labeling the boxes. We had movers load everything and it was stored for 3 months until we moved into our house. They had a detailed list and every box was numbered and had to be accounted for before they left. But I’m missing weird things. Things that wouldn’t necessarily have been packed in the same box—in the event that a box was lost (which it doesn’t appear to have happened). Things like my flatiron for my hair. Why I wouldn’t have packed it in the stuff for my 3-month rental stay, I don’t know, but I didn’t. 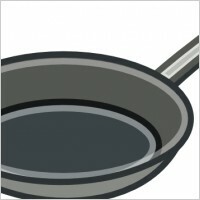 Then there’s my cast iron skillet. It wasn’t in the boxes with the rest of the pots and pans and I cannot find it anywhere. A framed photograph of my husband and me, taken for our church directory, was not in the box with the other three. A small green plastic wastebasket never turned up. My heavy scotch tape dispenser for my desk. None of these things should have been packed in the same box. But where are they? What are some things you’ve “lost” and did you ever find them? 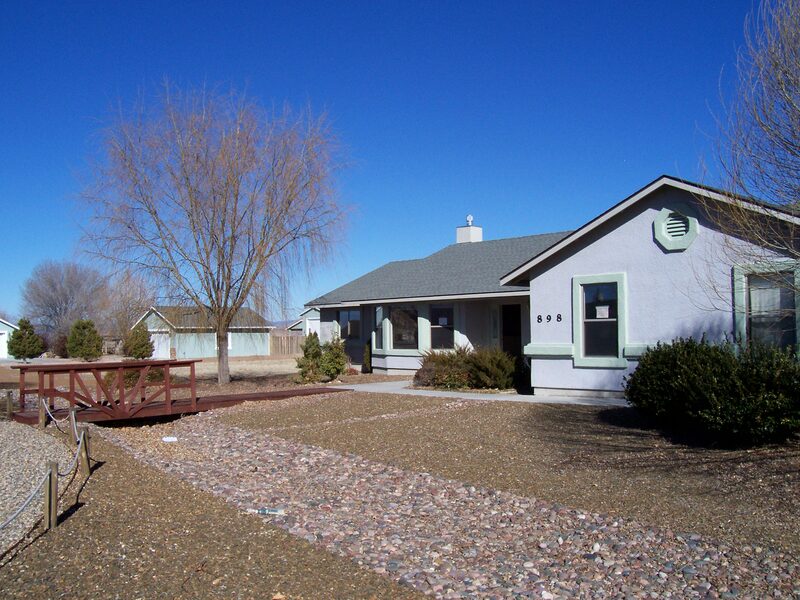 We’ve just completed our second move in three months, first from Mount Vernon WA to Prescott AZ, where we rented a cute but small cottage while we waited for our renters’ lease to be up on the house we already owned in Chino Valley. That day finally arrived and then we ended up waiting two weeks for our belongings to be delivered! (Lots of time for painting and doing minor repairs.) Apparently there had been some miscommunication with the movers, as we had understood our things would be stored in Phoenix and we just needed to give them 2-3 days notice. Not true. It was stored in Seattle, they had to wait for a truck to be available (about a week), then they made several deliveries along the way (another week). We were not happy. But at long last, everything arrived last Wednesday and we’ve been busily shuffling boxes around so we can make room to unpack, finding places for everything, then rearranging…you all know how that goes! I am so happy to be here! Our house is nice, very comfortable, and feels like home already. 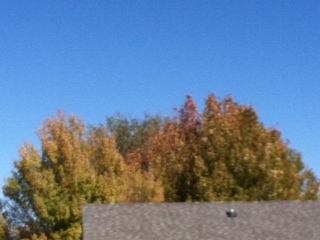 I wake up to sunshine with a big smile on my face, and go out to drink my morning coffee on the patio. No SAD for me this winter! Many of my friends have pictured me living in the sandy, seguaro cactus-filled desert of Arizona. But here in the North-central part of the state, we experience the best of a semi-arid climate near the mountains, near lakes, and many wonderful hiking trails. The weather, like my native state of Montana, can change from 70 degrees one Saturday to 34 and snow the next weekend and back again. 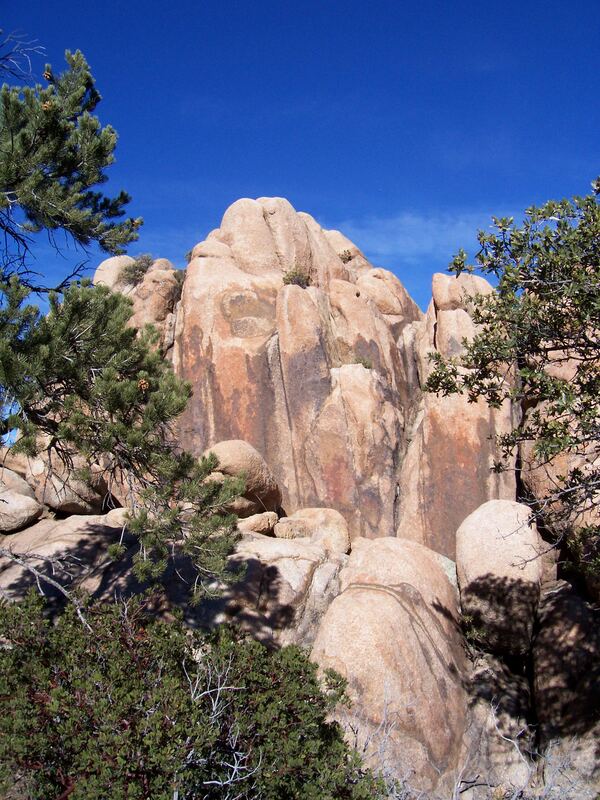 Prescott is bounded by the Santa Maria mountains to the north, the Bradshaws to the south and the Sierra Prieta to the West of which Granite Mountain is the dominate peak. 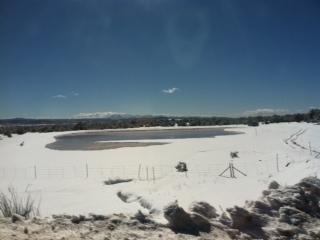 A snowy scene recently near Strawberry, AZ, on the way to Payson. 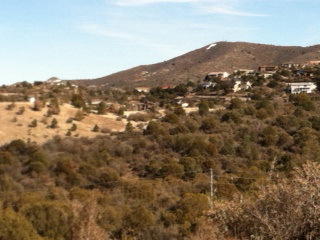 Prescott itself is built among the hills. 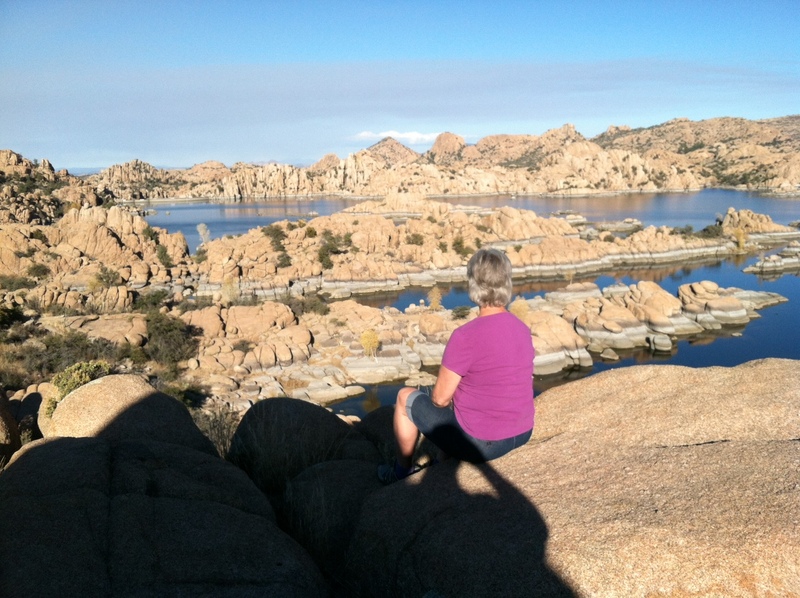 My favorite place, so far, to hike–Watson Lake amid the Granite Dells rocks. 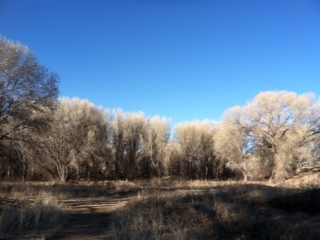 Also along the Watson Lake trail are groves of cottonwoods near Granite Creek which feeds into the lake. 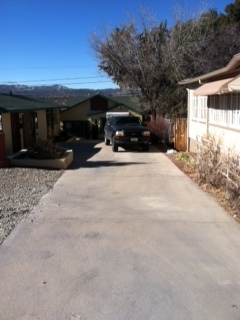 My husband had the fun job of backing the trailer down this l-o-n-g driveway after dark the first night we arrived. Glad it wasn’t me! 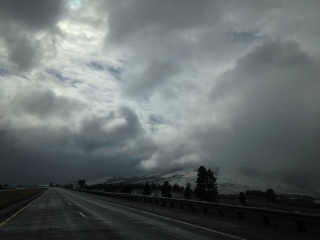 We’ve been in Prescott for 10 days now and have experienced the gamut of weather. 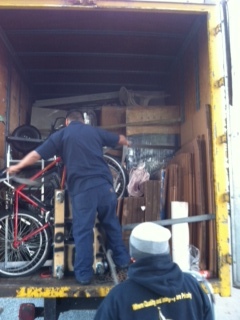 The first day, we had 63 degree temperatures and unloaded our vehicles and U-haul trailer in shorts and T-shirts. The next couple of days were partly sunny, but then it commenced to rain for three days straight! We thought we were back in the Pacific NorthWET! The temps plummeted and suddenly we were in the middle of a snowstorm! 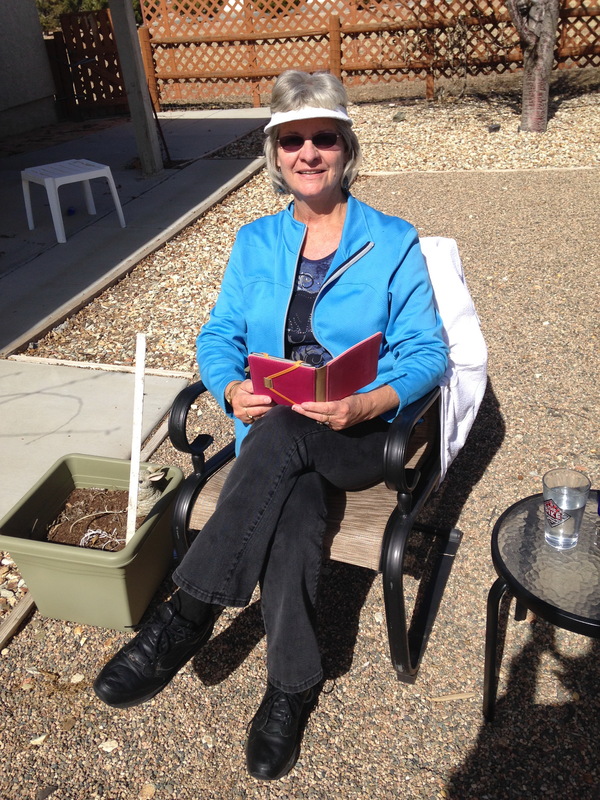 But at this writing, it’s back up to 48 degrees and the beautiful sunshine is making me smile! 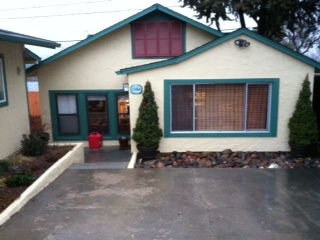 The little cottage we’re renting on Mount Vernon Ave. in Prescott. Must be an omen! 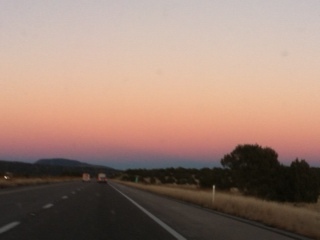 Another gorgeous sunset on the road between Prescott and Chino Valley. 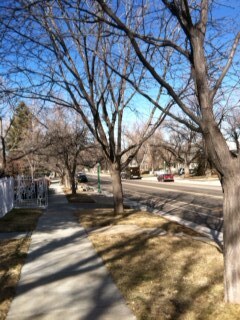 The tree-lined Mount Vernon Avenue in Prescott, our temporary home. One of the beautiful old homes on Mount Vernon Ave. Reminds me a lot of the University district in Missoula, Montana. Prescott (pronounced Preskett, emphasis on the first syllable) has an official population of 39,900 (although a Money Magazine report says 42,000), and Chino Valley (15 miles North), where we will be living in April, is listed at 10,800. The area has been named one of the top 25 places to retire, sits at 5,300 feet, with four-seasons: mild to somewhat cold winters and warm to hot summers. Highs range from 50 °F in January to 89 °F in July, and the average annual precipitation is 19.2 inches. Prescott is the county seat of Yavapai County. 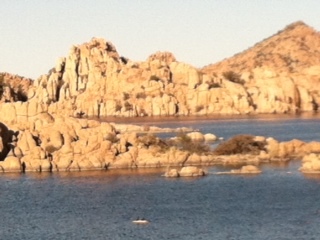 In 1864 Prescott was designated as the capital of the Arizona Territory. Phoenix became the capital in 1889. 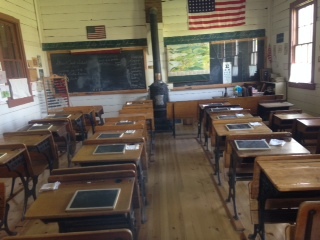 Prescott also has a place in western folklore with the fact that Virgil Earp, Wyatt Earp’s older brother lived in Prescott in 1879 and told him of the boom town in Tombstone, Arizona. 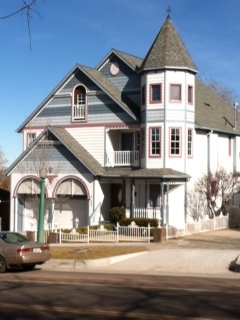 It is also rumored that Doc Holliday spent some time in Prescott just before heading to Tombstone. 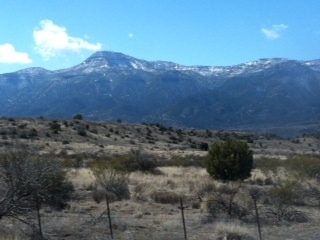 The “Quad City” area encompasses Prescott, Chino Valley, Prescott Valley and Dewey-Humbolt in Yavapai County. It’s a beautiful, sunny place to explore, and we’re happy to be here! 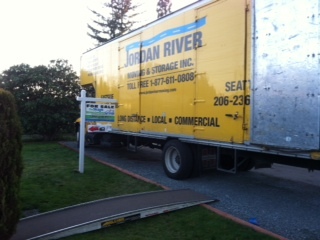 January 16, 2013: the moving truck pulls away from Mount Vernon, WA with all our worldly possessions (most of them anyway!) and we pack what we need for two and a half months interim living before we actually move into our new home in Chino Valley, AZ. We spend a couple of days in town to tie up loose ends and say good-bye to friends, then on Saturday the 19th we take off in the early morning fog, which lasted until North Bend. 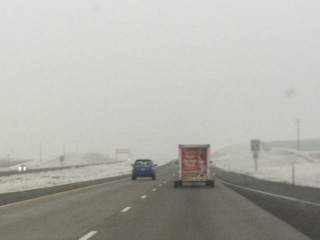 We saw sun for awhile but then were back in heavy fog through Pendleton, OR, a disappointment because I really would like to have seen the famous rodeo town a little better. This was my view for 1,400 miles (the back end of a U-haul trailer). Just as I was laughing at the “Scenic Viewpoint” signs as we climbed Deadman Pass over the Blue Mountains south of Pendleton on I-84, we suddenly broke out into the sun! Yippee! I felt a huge weight lifted and what a gorgeous view! 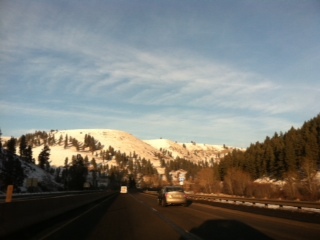 We stopped to rest for the night in Boise, ID, finding a frosty 1 degree temperature! We’re not used to that any more! I wondered what I had done with my longjohns! 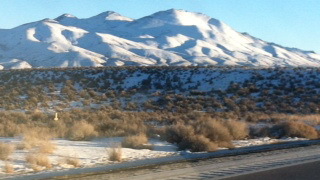 More snow in Nevada, but as we descend from White Horse Pass (elevation 6,031 feet), the temps get warmer. Much of this countryside reminds me of eastern Montana, where I grew up (minus the mountains). 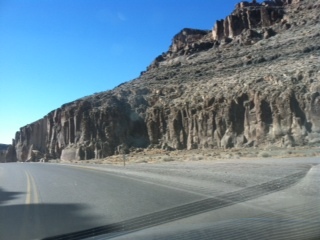 Going through the White River Narrows–beautiful and fascinating rock formation and petroglyphs. White River Narrows is located approximately 150 miles north of Las Vegas and 90 miles south of Ely Nevada. 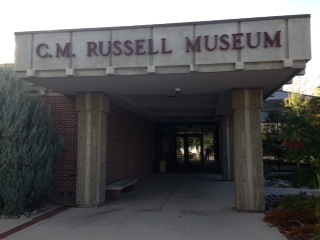 It was placed on the National Register of Historic Places in 1976. 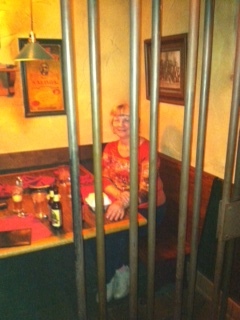 We spent the next night in Ely, NV and ate at a restaurant called The Jailhouse. Each table was in its own “cell” and the menu items were all named appropriately “Robbers Ribs” and the like. 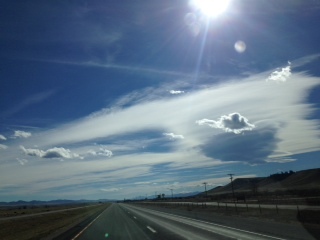 After leaving Hwy93, we were once again on the Interstate, I-15 which took us to Las Vegas. We stopped there long enough to grab a burger on the run and gas up our vehicles. We were in a hurry to get to our new home! Due to the load in the pickup and the U-haul trailer, my husband was not able to travel as fast as we normally would, especially going uphill. I was following along in my little blue Chevy, with my cat sedated by my side. 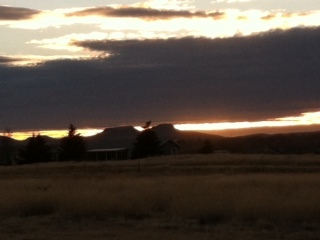 Our first Arizona sunset the evening of Jan. 21 as we approach closer to Prescott. Yesterday all our earthly possessions were loaded onto this truck and we are spending a couple extra days, saying good-bye to all our friends. Mount Vernon has been good for us and we will miss many things about it–most of all our friends, our church, the lush green. But we are looking forward to new friends, sunshine, good health and retirement. Au revoir, Auf Weidersehen, till we meet again!